Today was an interesting day. We woke up and went on a walk this morning. It was warm and muggy. We got back home at 11:00. We watered the plants with the hose, then dropped chloroine tablets down the well. We flushed it out as we re-filled the pool. 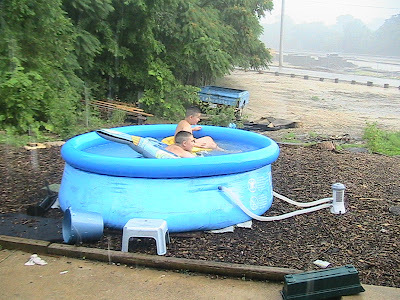 See, there's so many kids playing in it, that we have to refill it about every 3 weeks. It gets pretty nasty. So, we filled the pool, then Brent went off to work. I was super tired, so I laid down on the couch for a bit. Jimmy took a nap. I didn't really sleep, but I did rest. After my rest, I was feeling so much better. I gathered up the kids, and we headed out to the store. It rained a little bit on the way there. A storm was moving in. The wind was strong, and thunderstorms were to the north east of us. We also got a new bed sheet for Eme (Disneys' princess), new shoes for Eme too, a few new kid plates, and a Star Wars toy for the boys. I also found a Wheat Grinder. It was only 3 dollars. Now I can crack the wheat for my homemade wheat bread. I'm so excited! It's one of those old, metal ones. Pretty neat. Then, we headed out to the grocery store. We needed Cranberry Juice (yep), batteries, contact solution (can't put in the 'ole contacts until I get some), lite miracle whip, I can't remember the rest. There were only about 5 things that we needed though. I also bought the kids candy. It was 5 for a dollar, and they were SOOOOO excited. Oh yeah, I also got the kids fried chicken. 8 pieces for 3.99 is pretty good. 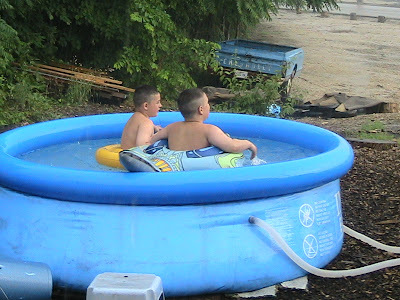 We headed home, and the kids wanted to play in the pool. It was stormy, but still stinkin' hot. So I said yes. They had to eat their chicken first. They sure liked that chicken. Jacob was first in the pool. It was a lot deeper than before, and super cold. Water from deep in the well, you know. But he liked it. Eme was next. She didn't like it so much 'cause it was so cold. Then Tom dived in. He didn't seem to mind the cold. The little kids and I were outside watching the fun that the boys were having. All of a sudden, we felt rain drops. Big ones. Within 3 seconds, it was pouring. I gathered up the kids shoes and clothes, and RAN for the back door. I made it just in time. Poor Jimmy wasn't so lucky. I yelled from the door for him. He started running and crying. He didn't know what was going on. He was a bit wet, but ok. So was Joe. Jacob and Thomas had a hay day out in the rain and the storm. Pretty funny. 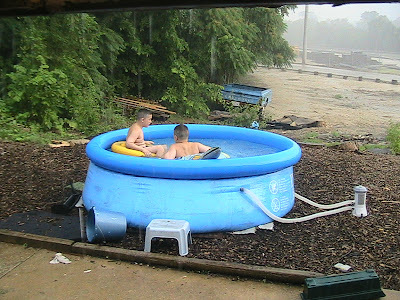 I guess if you are playing in the pool, who cares if it's raining. Joe decided that he wanted to go play, and stepped out the back door. There's no gutters on the house, so all the water falls straight down off the house. He was soaked in about 5 seconds. He sure didn't like it. He headed back up the steps, yelling "TOO MUCH WATER". I hurried and helped him back inside, and couldn't help laughing. SO FUNNY. It really was a good day. We didn't do too much, and that's ok. Lazy days of summer are great! If you look really closely in these pictures, you can see rain drops. BIG ONES!